By popular demand, the submission deadline for the PRESENCE 2018 conference in Prague has been extended to MARCH 1. Please consider submitting your work and joining us in Prague (or of course just joining us in Prague!). If you have any questions or requests, please e-mail me directly at lombard@temple.edu. 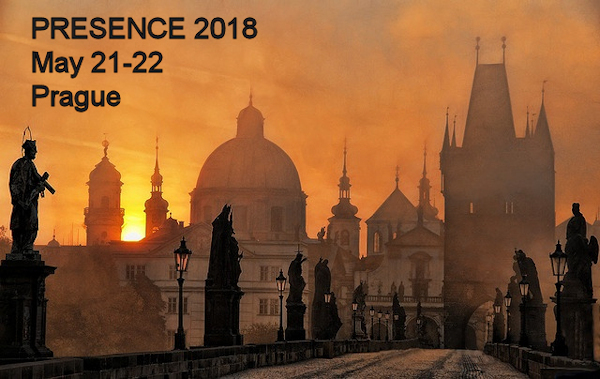 Note: PRESENCE 2018 precedes (but isn’t affiliated with) the 68th Annual Conference of the International Communication Association in Prague May 24-28. Telepresence, often shortened to presence, is a state or perception in which we overlook or misconstrue the role of technology and feel present in the environments and/or connected to the people or things we experience via technology. It’s increasingly relevant to a wide range of media experiences and application areas. Following a series of 17 successful Presence conference events, PRESENCE 2018 will retain the single-track format and enjoyable social environment of previous conferences while featuring an expanded variety of paper and poster sessions, panel discussions, keynote presentations, hands-on demonstrations of presence applications/services/projects, and informal discussion, networking and fun. Members of both academic and industry communities are welcome. At the end of the first day, all attendees are invited to a social dinner; we also hope you’ll join us for all or part of a day of demonstration visits and guided sightseeing on May 20 (the day before the conference). The registration cost is $140, with a discounted student cost of $100. The fee includes lunches on both days, coffee and snacks during breaks, and the social dinner. The term presence has many formal and informal meanings but is used by a growing interdisciplinary scholarly community to refer to experiences in which technology is overlooked or misconstrued in some way during a mediated experience. Long a focus of those who study virtual reality and environments, it’s increasingly relevant to a wide range of media experiences. For example, presence occurs when we get “lost” in the world of a novel, TV show, movie, video game or theme park ride; we’re convinced by the realism of paintings or graphic designs; we treat our cars, computers or other machines as if they have personalities of their own, and we feel like we’re “with” a person we talk to on the phone or in a video conference. The presence research community has been working to identify causes, characteristics and consequences of diverse presence experiences. The consequences identified so far – including arousal/relaxation, empathy, enjoyment, persuasion and more – make clear the importance and power of presence to improve communication across a wide variety of contexts and applications of interest to scholars and those who create media technologies and content. Presence as a concept and set of phenomena is related to the work being done in nearly every field and business sector from art to zoology, with particularly direct applications in business, education, entertainment and health. The 4000+ posts in ISPR Presence News and thousands more on its predecessor, the presence-l listserv, along with the Presence Bibliography on the ISPR website, illustrate the breadth of presence applications, and the breadth, depth and value of presence scholarship. The objectives of the conference are to deepen and update the knowledge of those already familiar with presence and introduce new scholars and practitioners to the centrality, pervasiveness, and value of presence phenomena, theory and research. The overarching goal is to help integrate and increase collaborative scholarship on presence. Researchers, scholars, technology designers and users, and citizens all face challenges related to presence. We invite submission in all of the categories below that identify, consider and ideally propose solutions to the challenges people in any or all of these groups face now or will face in the future. Data-based projects, concept and theory building work as well as personal (first person) reflections are encouraged.